Background: The transfer of patients between hospitals (interhospital transfer, IHT), exposes patients to risks of discontinuity of care. In this study, we aim to better understand which patients may (or may not) benefit from IHT by evaluating the impact of IHT on clinically important patient outcomes among a variety of patient diagnoses. Methods: We performed a retrospective analysis using 2013 100% Master Beneficiary Summary and Inpatient claims files from CMS merged with 2013 American Hospital Association data. Beneficiaries were eligible for inclusion if age ≥ 65, continuously enrolled in Medicare A and B, with an acute care hospitalization claim, and having one of the top 15 previously identified primary diagnoses, excluding Medicare managed care and ESRD beneficiaries. Transferred patients were defined as those with corresponding “transfer in” and “transfer out” claims. We performed a series of logistic regression models to calculate the propensity of undergoing IHT, using available patient and hospital characteristics, stratified by primary diagnosis. Within each diagnosis, transferred and non-transferred patients were matched by propensity score. We then performed a series of regression models, stratified by primary diagnosis, incorporating the propensity score and any imbalanced characteristics to analyze the effects of IHT on each outcome. Outcomes included length of stay (LOS), cost of hospitalization, discharge home, 3-day and 30-day mortality. Results: Our cohort consisted of 54,995 transferred and 3,258,325 non-transferred patients. Propensity score matching was successful for a total of 53,420 transferred patients to 53,420 non-transferred patients. After matching by propensity score, baseline characteristics were similar between transferred and non-transferred groups (Table). Across all diagnoses, transferred patients had significantly higher costs, longer LOS, and lower odds of discharge home than non-transferred patients. 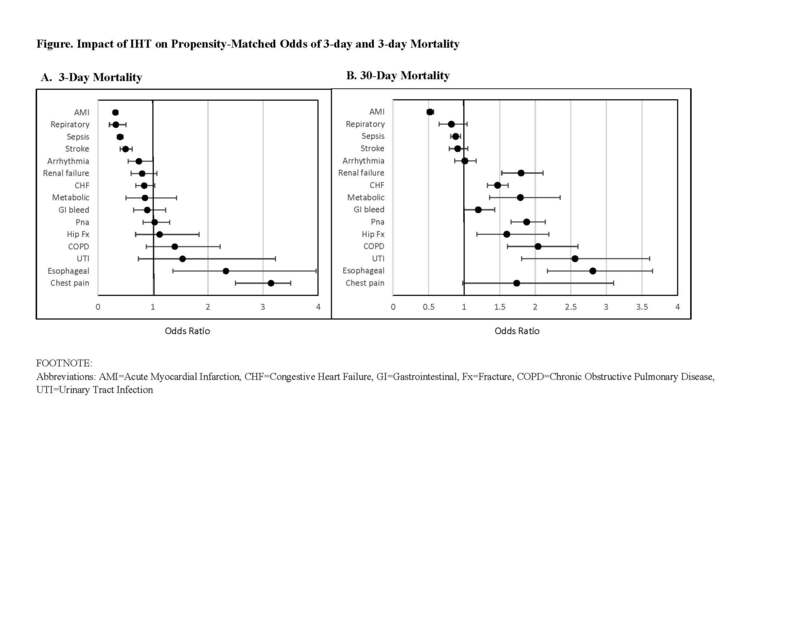 IHT was associated with significantly lower odds of 3- and/or 30-day mortality for some diagnoses and significantly higher odds for other diagnoses (Figure). Conclusions: In this nationally representative study of Medicare beneficiaries, IHT was associated with higher costs, longer LOS, and lower odds of discharge home, but was differentially associated with odds of early death and 30-day mortality depending on patients’ primary diagnosis. These findings can be used to assist in selection of patients most likely to benefit from transfer and can help aid development of quality improvement initiatives directed to those patients at greatest risk of transfer. Mueller, S; Zheng, J; Orav, E; Schnipper, JL. 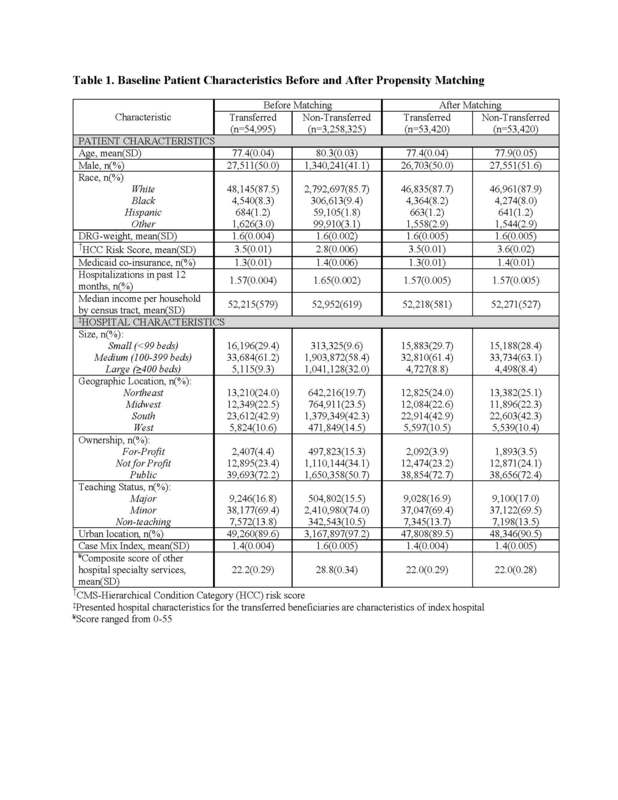 IMPACT OF INTER-HOSPITAL TRANSFER ON PATIENT OUTCOMES: A NATIONAL EVALUATION. Abstract published at Hospital Medicine 2018; April 8-11; Orlando, Fla. Abstract Top 15 Research & Innovations. https://www.shmabstracts.com/abstract/impact-of-inter-hospital-transfer-on-patient-outcomes-a-national-evaluation/. Accessed April 22, 2019.